The United States Congress designated the Muggins Mountain Wilderness (map) in 1990 and it now has a total of 7,711 acres. All of this wilderness is located in Arizona and is managed by the Bureau of Land Management. Close to the California border stands a cluster of rugged peaks at the western extreme of the Muggins Mountains, a region of colorful geologic strata and scenic landforms. Within Muggins Mountain Wilderness, elevations range from about 200 to 1,600 feet with the most prominent summits being Muggins Peak at 1,424 feet, Klothos Temple at 1,193 feet, and Long Mountain at 914 feet. Deeply cut drainages, such as Twin Tanks Wash and Long Mountain Wash, dissect the area. Prominent species of vegetation in the area include Creosote Bush, Desert Lavender, White Bursage, Rock Hibiscus, Desert Ironwood, Foothills Palo Verde, Blue Palo Verde, Buckhorn Cholla, Brittle Bush, Ocotillo, Catclaw Acacia, and Saguaro Cactus. Common wildlife includes Black-throated Sparrow, Rock Wren, Great-horned Owl, bats, ringtail, and side-blotched lizards. A few hardy day hikers, backpackers, and rock climbers make the trek here, but there is an excellent chance you'll have this dry area to yourself. This area only receives 3.8 inches of precipitation each year and July temperatures average between 79.6 and 106.6 degrees Fahrenheit. In December, temperatures average from 42.4 to 68.1 degrees. When crossing the Yuma Military Proving Ground, north of the Wilderness, visitors are required to stay on the main road. Muggins Peak Trail is 5.2 miles long and Muggins Mountains Trail is 5.0 miles. 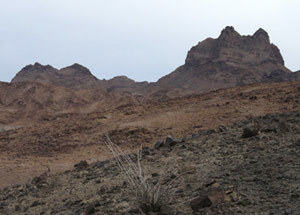 Planning to Visit the Muggins Mountain Wilderness? How to follow the seven standard Leave No Trace principles differs in different parts of the country (desert vs. Rocky Mountains). Click on any of the principles listed below to learn more about how they apply in the Muggins Mountain Wilderness.